Unforgettable experiences await in the exotic lands of Egypt and Jordan. A colourful, vibrant, rich and passionate culture will capture your imagination and bring dreams to life. Spectacular desert landscapes, home to thousands of years of history, great feats of archaeological wonder and Mother Nature’s sensational ability to create her own phenomenon. Evergreen Cruises & Tours invites you to follow in the footsteps of mighty pharaohs and biblical prophets as you uncover this unique part of the world. Evergreen Cruises & Tours has an excellent reputation for quality, value and professional service. From start to finish, your journey will be meticulously planned, arranged and coordinated. Itineraries are carefully designed with the appropriate balance of inclusions, must-see sights and free time, all planned to unlock Egypt and Jordan’s richness and vibrancy. In this brochure, you will find an outstanding combination of luxurious cruises and superb accommodation, combined with spectacular scenery, memorable attractions, sumptuous cuisine and friendly people to ensure your journey is unforgettable. Cairo’s reputation precedes it, a sprawling capital city with plenty of personality. While you’re there, you’ll visit the Great Pyramids of Giza and wander the stalls of bustling bazaars. Fly to Luxor and journey along the longest river in the world to Aswan. You’ll enjoy incredible scenery from the sun deck of an exclusively chartered ship, in-between onshore excursions to magnificent temples, tombs and monuments, including the temples at Abu Simbel, built to commemorate Ramses II and his wife Nefertari. 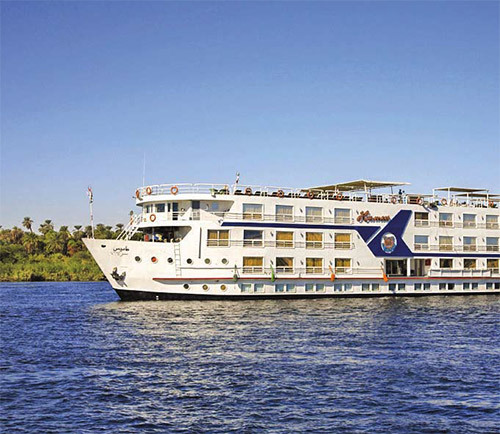 The contemporary and luxurious MS Hamees river ship will be your home during your four-night Nile River cruise from Luxor to Aswan. Elegant and thoughtful interior design plays host to excellent amenities, including a lounge bar and sun deck along with spacious cabins, complete with private ensuite bathroom. The Jordanian capital, Amman, thought to be one of the oldest on Earth, is your introduction to the country, before the Treasury at Petra lives up to its name, with its elaborate carvings. A team of local experts will proudly show you the best Egypt and Jordan has to offer. Discover for yourself why travelling with Evergreen Cruises & Tours and sister company, Emerald Waterways is the most relaxing and convenient way to explore Egypt and Jordan. People who ordered Egypt & Jordan also ordered the free travel brochures below. Click on the images to find out more about these brochures.